This week on WELSTech we look at project management software. From special events to school initiatives to worship planning, there are many large, multi-faceted projects to oversee in the church and school setting, and project management software may be the solution to that need. Project management – Churches and schools can benefit from the organizational and collaborative capabilities of project management software. Martin and Sallie are joined by WELSTech Conference presenter, Julia Wagenknecht, to discuss uses for the various project management software solutions. WELSTech is back with tips for eliminating some of your workload and serving others in the process. There’s also news on the Google Apps front, a fun survey app for the classroom, online classes and new wiki pages to explore. Join the conversation! Don’t Do Everything – Martin and Sallie return to this season’s book discussion, looking at Part 5 of Matt Perman’s What’s Best Next: How the Gospel Transforms the Way You Get Things Done. This part of the book focuses on the “R” step in Matt’s DARE process for managing work, Reduce, and offers practical ideas for eliminating portions of your workload. 378 – It’s Conference Time! Enjoy the Texas warmth on this week’s WELSTech, and learn all about the goodness in store at this summer’s WELSTech Conference. Parenting in the digital age resources, Outlook comes to smartphones and Logos 6 giveaways round out this very full episode. 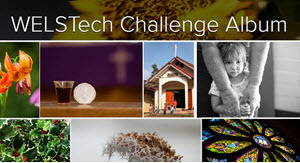 Tech in Ministry Smorgasbord – Martin and Sallie walk through the variety of topics and speakers who will be part of this summer’s WELSTech Conference 2015, happening July 9-11 at Country Springs Hotel and Conference Center in Waukesha, WI. David Tess, Director of Digital Education at Wisconsin Lutheran College shares details about the keynote presentation he’s preparing for the conference. WELS Interactive Faith online Bible study continues the study of Judges for the next two Wednesday’s at 6:00 and 8:00 pm CST. https://welstech.wels.net/wp-content/uploads/2015/02/welstechconf2015_145x125.png 125 145 Sallie Draper https://welstech.wels.net/wp-content/uploads/2017/06/000welsTechLogoEnfoldnew.png Sallie Draper2015-02-03 17:25:442017-06-06 10:44:45378 - It's Conference Time!